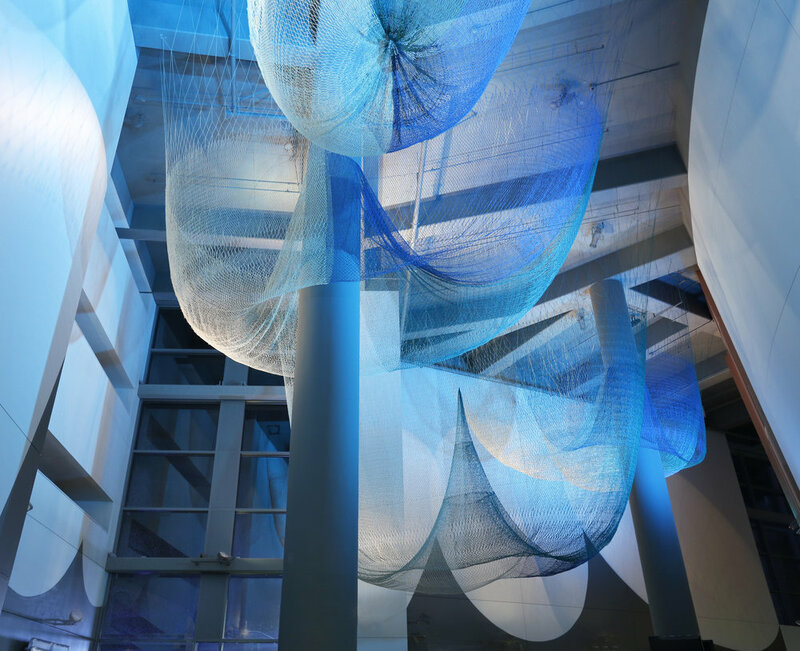 For the University of Oregon’s Matthew Knight Arena, Janet Echelman explores the interconnectedness of viewers with the object being viewed. What appears to be a voluminous ethereal presence from a distance becomes five distinct forms as the viewer gets closer, a nod to the teamwork between players on the court. Once underneath, the viewer can see the subtle shimmer of blues and greens as well as the bilateral shift from light to dark, which highlights the curvature of the arena’s architecture. The artist plays with visual perception, namely the Gestalt principles of proximity, similarity, and closure. In the sculpture, single forms merge into one organic shape that is so large and complex, one can never take it in fully from one vantage point. Viewers must visually piece together the parts from different perspectives to complete the artwork in their minds. The voluminous form is composed of custom-blended twines and incorporates panels crafted by hand merged with machine-knotted portions. For coloring, Echelman engages the human mind’s tendency to unconsciously join separate like-colored forms together. The viewer’s eye connects between the blue and green forms, which interplay with their pale yellow counterparts, the color of sunlight. 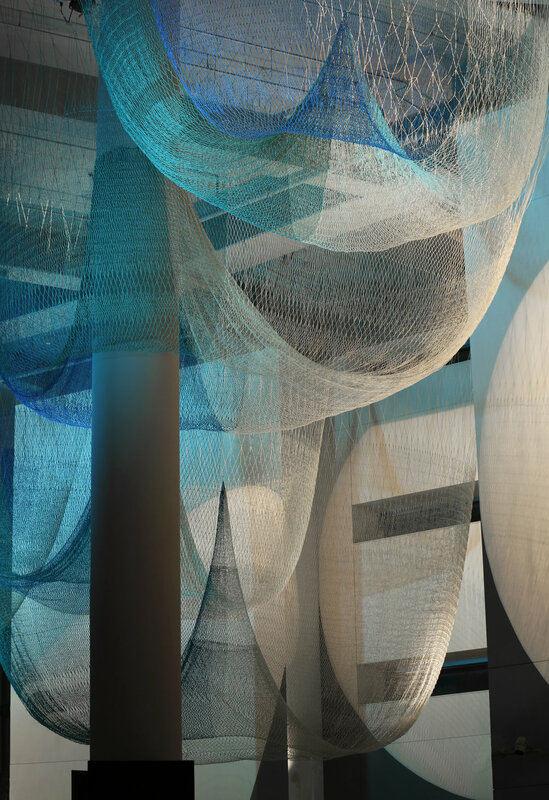 The sculpture is designed to respond to and engage with its surroundings, acknowledging the importance of the role of the spectator as the trigger for interactivity. Sensors near the artwork pick up the physical movement of spectators, activating specially programmed spotlights that cast shadow drawings onto surrounding walls. These shadows layer atop a silhouette wall painting that follows the parabolic curves of the suspended sculpture. The title "Allegory" references the Greek philosopher Plato’s classic work. His Allegory of the Cave tells the story of people who lived chained inside a cave facing a blank wall, with a fiery light behind them. The shadow shapes they see on the wall are merely projections, but it is the prisoners’ entire understanding of reality. Echelman’s work asks viewers to question what they see in front of them – a dialogue between object and viewer, light and shadow, reality and projection.